Featured! Twisted Designs Home | About Us | Opportunities | Sponsorships | Contact Us! This week on Handmade Men Featured we had the pleasure of chatting with Lindsay from the popular Twisted Designs shop on Etsy. This shop caught our eyes because they create some amazing earrings, studs, and posts for men which is something we don’t get to see very often, and they blend wood and metal in ways that we’ve never seen before. For any guy who has pierced ears, or anyone who loves the look of stylish and subtle ear gear, you’re going to love what’s coming from this amazing shop! 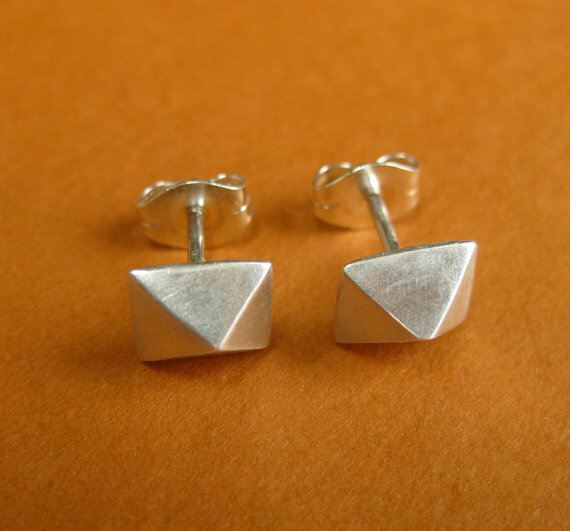 We have a feeling that men’s handmade earrings, studs, and posts are going to be a big trend throughout 2013! Twisted Designs is a collaboration of Sterling Silver and exotic wood. The two come together to make a fine assortment of unique everyday jewelry. I work closely with my father-in-Law, Dan May (who happens to be my neighbor) on the wooden pieces. He is a master carpenter with over 30 years of experience. He has worked for many celebrities including Steve Millers sound studio. 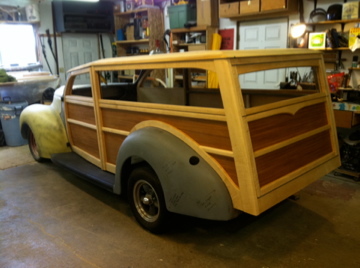 He also makes custom hot rod Woodie cars when he is not making unique wooden jewelry. This collaboration between wood and metal comes together to make a unique collection of simple an unique everyday jewelry including many hoops, stud earrings and wooden pendants. Very cool! We love everything in your shop and the detail and craft is clear right from the start. How did you come to work with the unique materials, designs, and techniques you use every day in your shop? I love working with Silver and wood because they are timeless and transcend fads and fashions. They are high quality materials that will last years yet are still affordable. And they look amazing together! 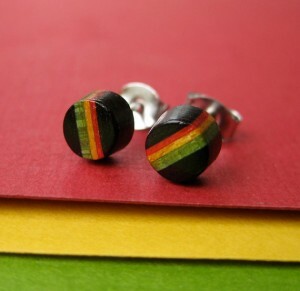 Bright Rasta colors combined with Black ebony are so subtle yet unique. These pyramid studs are extremely versatile. They are my most popular item in the shop. Dan carved out a pyramid from wood and I used that to make a mold for the Silver. 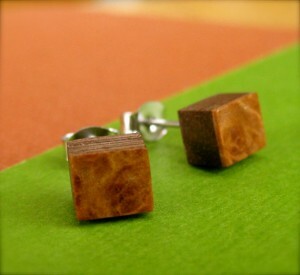 This pair of cube shaped Elm Burl wooden studs have great detail. As an artisan and as a supported of handmade, why do you think it’s such a good idea for men of all styles to look at handmade and artisan items when shopping for themselves or their loved ones? In addition to the amazing wooden and sterling silver stud earrings featured above, Twisted Designs also creates amazing pendants,a bracelets, rings, necklaces, and a whole array of other pieces that are truly ‘must see’! Thank you so much to taking the time to chat with us! Tagged Bracelets, Earrings, etsy, Jewelry, rings, Studs, Twisted Designs. Bookmark the permalink.